I can't believe we are closing in to the days of the school year. This is week 29th, One more to go! 1) Regarding SDUHSD credit acceptance policy issue, we will host an informational meeting in PTA room (F-209) at 10 am - 10:30 am this Sunday. Parents are welcome to join. 2) Looking for college prep SAT and consultation? Join us at the presentation by IvyMax on this Sunday, 1:30 pm - 3:00 pm, Room S5-205. See attached flyer for details. 3) Credit class Parent Service Deposit refund continue til next week 5/14. Do Not miss it ! 4) Credit Program Placement Test for students not currently enrolled in Hua Xia is this week, May 7, 12 noon - 1:30, at I-101A. 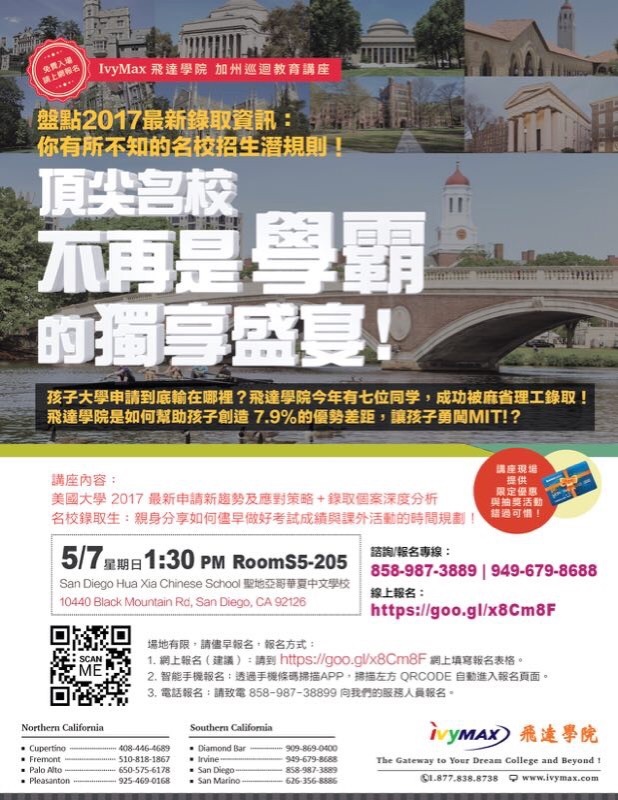 Check in time 11We encourage all 7th grade and up students who wish to be enrolled in Hua Xia Credit Program in 2017_18 take this test. a) complete 2017_18 registration and bring a copy of the confirmation. Students won't be admitted to the test site without registration. e) your parent's phone number and email address. 5) Visa service on May 7, 10 am - 2 pm, in the office. 6) May 14 is the last school day for 2017-2018. All classes will be in full session. 7) Student store opens on May 14. Be sure to bring your hard earned coupons. 8) There is NO event on May 21 as previously indicated on school calendar. Graduation/Promotion celebration will be combined with SDHXCS 20th anniversary celebration on Saturday, June 3rd. More detail instructions will follow. Please check your email or school website frequently in the next few weeks for updated news. 9) Registration for 2017-2018 continues. We've noticed that a few parents were charged multiple times due to various operational errors. Please read and pay close attention to the registration instructions to avoid unnecessary confusion. 10) Registration deadline for current Hua Xia students is May 14. After 12:00 am midnight a $35 registration fee will be automatically added. If you have to pay by check, be sure to submit to the office before 3 pm on May 14, or post marked so by mail. 11) Online payment is the best way to complete your registration. No more waiting in line, No more requesting for receipt. Hassle free! 12) Enrichment classes registration will be open at a later time during the summer. Please visit our website in July.